Posted on April 16, 2019 by wp-admin Posted in Autel Tools	. We’d like to suggest that the new type Nexiq 125032 USB Link interface to you , this model have the function of wireless connect and bluetooth . it with the best price USD290 per set , without leather suitcase . If you need the leather suitcase for protection , you just need pay more USD15 . And make the order for A209-2 . 2015 New Bluetooth version Nexiq 125032 USB Link Diesel Truck Diagnostic Interface with All all adapters and cables. 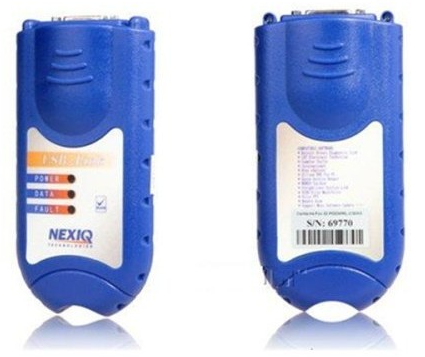 Bluetooth NEXIQ 125032 support link computer to vehicle wireless connect. Nexiq 125032 can work with many kinds of heavy duty, trucks, engines and transmissions, brakes and more, minimizing your investment in multiple brand-specific diagnostic. 3.For Hino, Perkins, Volvo, Cat, Nissan software,only XP system.Other software can be installed on XP or WIN7 32bit. 4.When you change time of your laptop, Cummins Inline software will get locked, please download the attached file “how-to-unlock-cummins-inline” to solve it. Do you have any interesting for this item ?Or do you need any other auto diagnostic scanner ? If so , welcome to autonumen.com . Thank you . Tags: 125032 nexiq, NEXIQ 125032, NEXIQ 125032 USB Link, NEXIQ Technologies USB Link, NEXIQ USB Link, NEXIQ USB Link Driver	. Posted on April 1, 2019 by wp-admin Posted in Autel Tools	. What are the features of nexiq usb link? 1.Compatible with applications that diagnose engines, transmissions, ABS, instrument panels and more. 2.Reduce reprogramming times with direct USB connection. 3.Mixed fleet capabilities with broad protocol support. 4.Quick access to vehicle data for maintenance or management reports. 5.Quickly attaches to vehicle’s diagnostic connector. 6.Easy portability increases flexibility, May be used with desktop PC or laptop. What is nexiq usb link API Support? 4.Not all applications are included. If compatibility confirmation is required, more information is needed, or there are questions about an unlisted application, please contact us, a specialist will help you make the right choice. What is nexiq usb link Protocol Coverage? NEXIQ support Heavy-Duty, Light-and Medium-Duty Trucks, CONSTRUCTION EQUIPMENT like (Wheel loader, Articulated Hauler and Excavator), Genset. Is this a ‘real’ deal on a NEXIQ USB-Link? Posted on February 12, 2019 by wp-admin Posted in Heavy Duty Diagnostic	. So you found a great deal on a NEXIQ Technologies 125032 USB-Link from China. Sounds great! Hey that $50 savings is a steak dinner, so what if the product has a 3-4 week delivery, if itâ€™s $50 off the deal.Â While you are ordering the USB-Link go ahead and grab yourself a Rolex watch. Itâ€™s even a better deal! You might laugh at the Rolex comment but the similarities are frightening. When you receive the products, lay the watch and USB-Link out side by side. From a few feet away it looks like you made a great buy. Step closer and that knot will start to tighten in your stomach. Youâ€™ll soon realize that maybe this was not a good idea. When you start to really look at the units you will see that the little hands are really just printed on the Rolex face. Now look at your USB-Link and the three ledâ€™s that are on the non-U.S. manufactured USB-Link are printed on the sticker. When you purchase a Heavy Duty Diagnostic NEXIQ USB-Link you can rest assured that NEXIQ is working closely with each of the OEMâ€™s to make certain that your purchase will be able to run operate all the OEM software and have the proper connector and communications with the truck. Kind of like the Rolex, you donâ€™t want to know what is inside the fake USB-Link from China. It might work, it may not work, and it may destroy the customers ECM. Hey, but you saved $50? We can guarantee that when you need new drivers for the next OEM software update that the China built NEXIQ USB Link will not work with the driver updates. Donâ€™t get ripped off!Â Purchase your NEXIQ USB Link from an authorized dealer. On a final note if you want to save $50 off retail on a Rolex, I have a fake one that was given to me as a gag gift that I am willing to let go.